Meyer lemon trees (Citrus limon, Citrus meyeri) are also commonly referred to as improved Meyer lemon trees, dwarf lemons, limones or valley lemons, according to the Plant Aficionado website. Belonging to the Rutaceae (citrus) family, semi-dwarf Meyer lemon trees grow best in USDA Hardiness Zones 9 to 11, which provide warm temperatures most of the year. Semi-dwarf Meyer lemon trees can grow well in other areas, as container trees. Caring for semi-dwarf Meyer lemon trees begins at planting. Select a site for the semi-dwarf Meyer lemon tree providing full sun. Allow enough room for the mature size, which can be 8 to 12 feet in height and 3 to 5 feet wide. Remove all foliage growing within a 3- to 5-foot circle. Dig a hole the same depth and two to five times the width of the tree's container for planting. Place the tree's roots in the hole. Backfill with removed soil halfway, then fill with water to settle the soil. Finish filling the hole. Use a shovel and dirt to form a wall that creates a watering basin encircling the tree. Make it wider than the actual planting hole, and at least 5 to 6 inches high and 6 to 8 inches wide. Fill the basin with water and allow draining. After the soil settles, add more soil on top of the tree’s roots, if needed. Fill the basin for the newly planted citrus tree two times a week for the first four weeks. Check the soil after that to a depth of 1 inch for dryness, and fill the basin when needed. 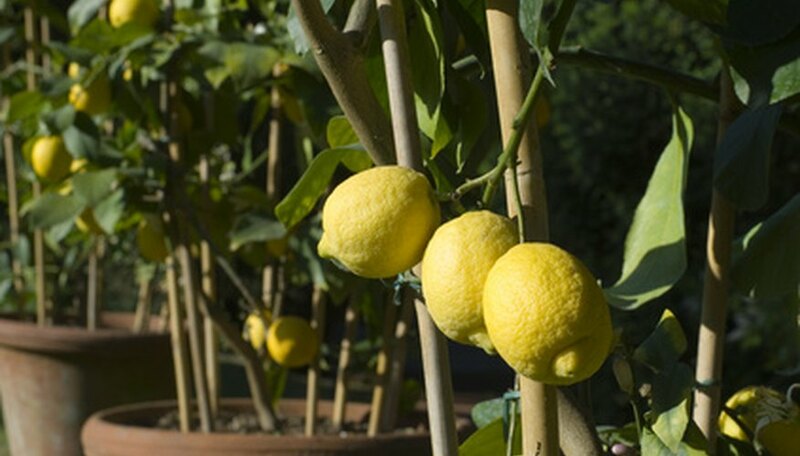 Cultivate (gently stir) the top layer of soil lightly in the area around the semi-dwarf Meyer lemon tree’s canopy line to prevent weed growth. Or cover the area with several inches of mulch, but keep it at least a foot from the tree’s trunk. Apply a specially formulated citrus fertilizer monthly (as directed) until November, after growth begins. Spread the fertilizer around the canopy area, staying at least a foot from the tree’s trunk. Water the semi-dwarf Meyer lemon tree after applying. Cut away any suckers (shoots) appearing around the bottom of the tree. Pruning is typically not needed for citrus trees, except to remove any damaged, broken or unhealthy branches.